Sure Looks Like a Bottom, But Is It? Let’s start with a look at the chart of gold (click to enlarge), starting with the peak in the summer of 2011 at around $1,900 per ounce. If you want to be like me and pretend you are a technical analyst, you can draw red down-trend lines from the peak down to the next high. 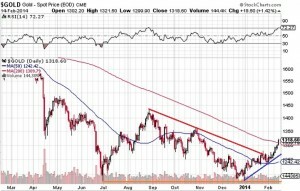 The first such line indicates that gold could rise to almost $1,700 and we would still be in a down trend. Even $1,400 would not indicate that a new bull market has begun. 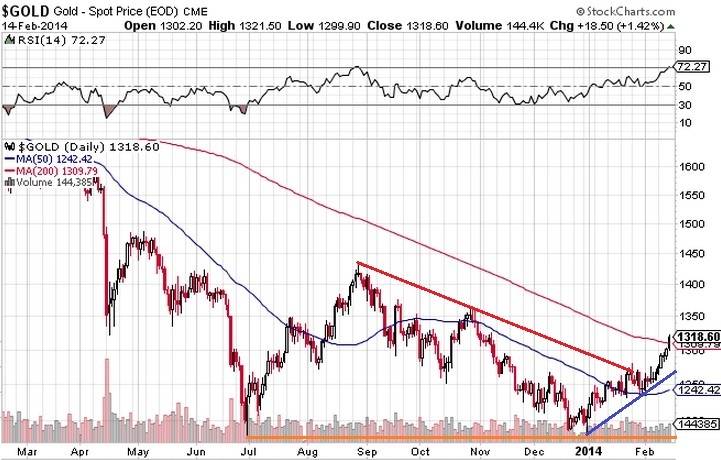 If one starts with the $1,700 level at the start of 2013 and draws a down trend line it is quite clear that we have broken that line, and that’s good news, and the decisive close on Friday (Valentine’s Day) above $1,300 is also great news, but it’s important not to get too giddy at these levels. That’s why a long term chart is instructive. Things are looking good, but let’s not get crazy. So, now that I have started you off with a not great looking chart, let’s zoom in and look at a one year chart, which looks much “prettier”. On a one year chart the bottom at around $1,180 in July, repeated again on New Year’s Eve, does indeed appear to be a bottom. From $1,180 to $1,318 in six weeks is quite encouraging. That’s 11.7%. Not bad. But again, let’s not get ahead of ourselves here. Big increases are often followed by corrections. In fact, big increases are always followed by corrections. That’s how it works. Gold looks good, but individual stocks look even better. 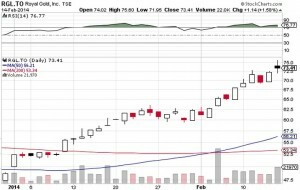 One of my core holdings is RGL.TO – Royal Gold Inc., and year to date it’s advanced from $47.50 at the start of the year to a high intra day on Friday of $75.60, for a gain of almost 60% in six weeks. Wow. 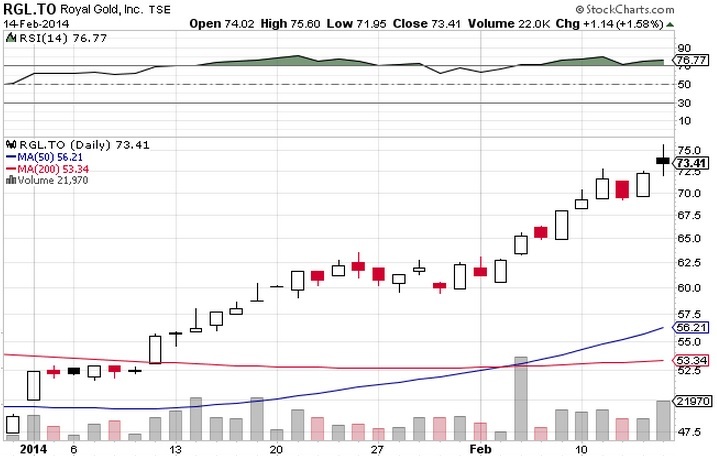 This is a blue chip, dividend-paying stock, not some junior exploration company, so a gain of 60% in that short a period of time is remarkable, emphasizing the fact that these stocks were woefully over-sold, and due for a correction. I’ve been “burned” on this massive run up, as I’ve sold call options against my Royal Gold all the way up, so I have not fully benefited from the upswing. So be it. I keep rolling the calls forward, buying higher values for next month, and at some point the stock will pull back and I’ll benefit from the strategy. So what does one do now? If you are not in the market at all, I would wait to deploy cash. The chart of Royal Gold shows an RSI of almost 77, which is very high, so a correction is very likely. Do I expect the stock to continue to advance at 10% per week? I do not. A pull back, perhaps to the $60 level, would be a much better entry point. If you have gains, take them. I have one junior resource stock that is up over 100% since this run began, so on Friday I sold half of my holdings. I have recovered my original investment (and more), so I am playing with house money. That’s good. For my blue chip stocks, covered call writing makes sense at these lofty levels. If you can sell a call for a dollar or two higher than current market value, expiring in a week, why not take that bet and pocket the money? 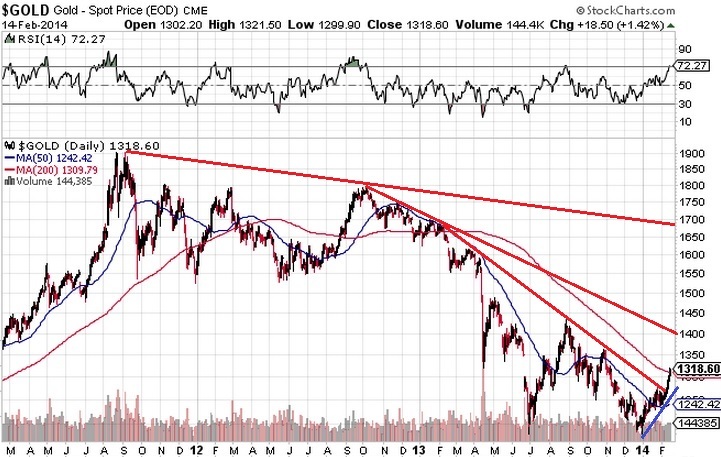 Perhaps the Big Boyz want to make gold look attractive so they can crash it again. Perhaps they have lost control over gold. I don’t know, and I don’t care. I’m enjoying the run while it lasts. It’s fun, so let’s not over think it.